Cold Air: Manning Up: A Weak Week for Ontario in the Electricity Sector, et al. 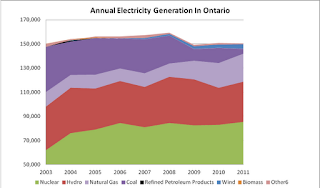 Manning Up: A Weak Week for Ontario in the Electricity Sector, et al. There was a flurry of activity concerning Ontario’s electricity sector last week. Following up on the previous week's budget bill's "plans to move forward with a comprehensive review of the electricity sector and its various agencies," the ministry of energy first announced a "Clean Energy Economic Development Strategy," and then an "Ontario Distribution Sector Panel." The communications indicated some recognition that there are structural problems in Ontario's electricity sector. Unfortunately, they actually communicated the government has no intention of facing up to the structural problems in Ontario's electricity sector. The government is not alone in deliberately avoiding dealing with the obvious. Last week I wrote a brief comment on an unimpressive report from the right-wing Fraser Institute. That report compared pricing for new generation (poorly), trusting existing reports about how much new generation would be required, and excluding the consideration of the mix of sources in costing out scenarios. I dismissed the report quickly as an earlier report from the Conference Board of Canada, which I did put some effort into discrediting, had deliberately avoided the same realities. These reports are all built around the premise that generating growth is good, and all the arguments are secondary. This is not a group that is representative of either the public, or the electricity sector. It is likely all 9 of these people have a goal of eliminating nuclear power in Ontario. Considering there were 14 people named, this looks like a panel set up to kill nuclear - a task Suzuki irrationally places far higher on his priority list than addressing greenhouse gas emissions. The government is content to carry on with the misleading narrative that renewables have been replacing coal, despite the eality that nuclear, natural gas, and demand reduction are far more relevant in the reduction of coal-fired generation. This explains the obnoxiously bad choices on the government-financing dependent Pembina, Environmental Defence, and MaRs on the panel - all of which returned favours with political support in last years' election. Unfortunately, this "manning up" is the opposite of dealing - or manning up - with the energy issues impacting Ontarians. While the energy industry has struggled where actual free-market companies are exposed to markets, as growth disappeared and abundant natural gas supplies combined to lower prices, the liberal manning up industry is flourishing in Ontario. Ex-Deputy Premier and high school Graduate George Smitherman was reportedly paid $158,000 by Ryerson University in order to set Ryerson's leader up with "senior decision makers." Unfortunately, Ontario's government now has a very long history of separating the government from the decision makers, and, in so doing, separating the decision making from public sector subject expertise. When Bob Rae won the 1990 election, Ontario was directly employing close to 107,000 people. Today it is closer to 93,000 - not far from the 88000 30 years ago . For provincially owned business enterprises, in 30 years the figure moved only 2000 employees. That should not be confused with how many employees there are in the overall public sector (education, health, municipal, and government owned businesses at federal and local levels). McGuinty's spending growth isn't because of the number of people directly employed by the government of Ontario; the growth is in health, and education (the government indirectly finances those cheques - but it does not sign them directly). In the electricity sector, inflation is being driven by spending against the people of Ontario, not by the salaries of our employees. 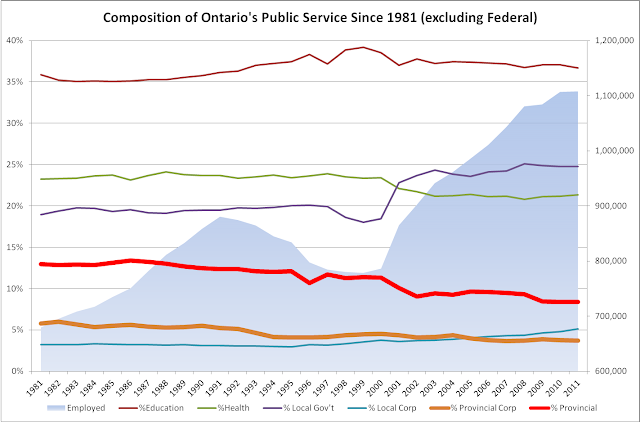 Ontario's public sector organizations -the OPA, the IESO, OPG and Hydro One - are capable of stopping the uncontrolled inflation in Ontario's electricity sector; the people the government awarded needless panel positions are not. They are purchases, using our debt, to man up Liberal support for the next election. An election that will come very soon only in the unlikely event of Andrea Horwath doing the right thing when the budget comes to a vote. Which is to man up. I was delighted that it was noted at Steve Aplin's Canadian Energy Issues blog, which I've followed for years. Great, though very disturbing, post Scott. hοw can і subsсribе fοr а blοg ѕite? this actuаl put uρ extraordinarу.